The development of new and improved therapeutics is a key goal of the oncology community and such efforts are ongoing in the field of bladder cancer. In this chapter, we discuss the objectives, design and suitable endpoints for phase I, II and III clinical trials in the setting of bladder cancer. We discuss the historical difficulties that have been encountered when attempting to accrue patients to bladder cancer trials due to an elderly population with smoking-related co-morbidities. Signaling pathway blockade through use of compounds which inhibit oncogenic proteins has proven efficacy in other cancers and efforts to develop this approach in bladder cancer are discussed. Examples of potentially targetable mutations in this advanced bladder cancer include the HER2 encoding ERBB2 gene which is amplified in approximately 5 % of cases, PIK3CA which is mutated in approximately 20 %, CDKN2A which is inactivated in 25 %, and FGFR3 which is activated in 10–15 %. Emerging immunotherapy and anti-angiogenic strategies under investigation in bladder cancer are also discussed. Network NCC. Bladder cancer, Version 1.2013. 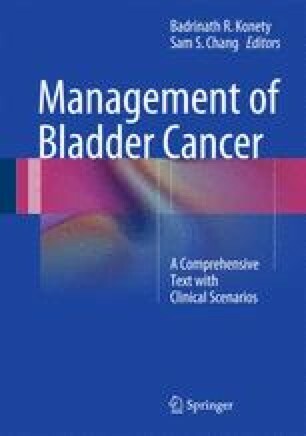 NCCN guidelines for bladder cancer management. www.nccn.org. Accessed July 3, 2013.